Not Possible IRL: Concept Art that's fun, or intellectual - you decide: Gazira Babeli's "Collateral Damage"
Concept Art that's fun, or intellectual - you decide: Gazira Babeli's "Collateral Damage"
The day that code performer Gazira Babeli (rezzed March 31, 2006), joined the Not Possible IRL group, I became so excited that I informed my Real Life friends and family. It's just that no other content creator in Second Life has managed to encapsulate, illustrate and celebrate the core concept of our group better than Gaz. Plus, she's got one wicked sense of humor. 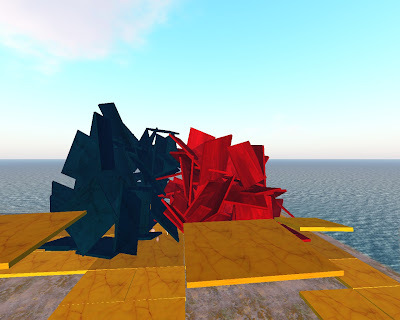 Gazira's "Collateral Damage" show at her Locusolus sim is simply the most sumptuously diabolical and hilarious venue in Second Life. If you haven't experienced it, then allow me to nudge you as politely but as firmly as is necessary: on your feet, go, go, go, get a move on right over there quick quick. You can thank me later :P Oh, and your experience will be greatly enhanced if you take a friend or two along. Really. Until today, I had held back from revealing much about "Collateral Damage" other than to gently but enthusiastically urge you to go, largely because the element of surprise is a bonus... but alas, some people won't take a friendly hint. ;) Fact is, I am always astonished when I learn that someone hasn't been there. Art critic and curator Domenico Quaranta has already done a brilliant job of analyzing the show, and numerous other fascinating write-ups exist, such as this one by Esther DeCuir, so I will limit myself to sharing a pop/superficial - though blissful - review, and here it is: Gazira amuses herself and you by taking liberties with your head and your avatar. There are two very tall towers near the sim's entry point marked with a plaque that reads: "Unbroken Eggs: Monument to Luciano Fabro, July 2007." Chance Abattoir and I watched as Jurin Juran walked between them. Within seconds, the buildings collapsed atop Jurin. This being a virtual environment, the buildings promptly reassembled themselves and Jurin rejoined us, along with SuezanneC Baskerville, who had just arrived. SuezanneC got into the spirit of things right away, and began trampling the pizzas, which responded by melodically bouncing her off, all the while bleating riffs from that Neapolitan tune "O Sole Mio," and emitting generous clouds of particles. Meanwhile, Jurin had been caught inside a can of Campbell's soup and was getting a peppy shake. Chance was mid-air, having disobeyed instructions that read "don't say new media," and being subsequently possessed by a mini-tornado that didn't let go until some precise words were uttered. Then, SuezanneC and Jurin discovered some large slabs of concrete that simulate a rather vigorous earthquake when stepped on. They proved to be brave souls and forged on. We all reconvened at a platform surrounded by poseballs, and hopped on. "Come together" - as it is called - would be putting what happened next, lightly. Each avatar is taken through a series of fun and silly animations separately, but all participating avatars are merged together. 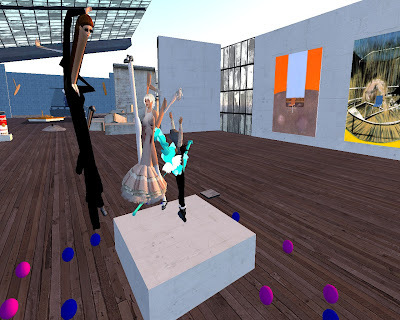 There are several other remarkable pieces within the installation, but probably the most controversial is "Avatar on Canvas," where Gaz has set up three Francis Bacon paintings with chairs that - once used - deform the avatar. 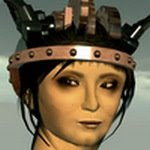 Most of us treat our avatars with the same degree of narcissism and reverence that we do our Real Life bodies, so participating in this exploit requires a bit of open-minded loosening up. Speaking for myself, I can't recommend this enough. No matter how many times I've done it, it invariably cracks me up all over again. ...and, I believe, that is exactly what Gazira set out to accomplish. Ready? Teleport directly from here. Many thanks to Jurin Juran, SuezanneC Baskerville and Chance Abattoir for being such good sports, as well as great fun and top-notch conversationalists all through this comical experience. 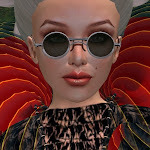 bettina, thank you so much for blogging about this over-the-top place to visit. I never laughed so hard the entire time I explored with my friends. Nothing says "fun" like getting your avatar all stretched out after becoming a piece of "wall art" then hitting some pose balls and getting stuck in soup cans! Best part? After a quick relog my shape went back to normal! Can't wait to see where you discover next! This exhibit is just amazing. Between the faucet dripping all kinds of delightful things (cows, landspeeders, guitars, hamburgers), soup cans with attitude, insertion into miniature worlds...there's so much to see and do. And the avatar deformation? Too wild. I ended up looking like something out the movie "The Thing" by the time I was done. I have to admit, I was figuring the effect would wear off after a few minutes, and when it didn't I got a little freaky. But as Misty said, a quick relog put everything back in place. This is a fantastical thing to see, and the time and effort put into it must have been incredible. Well worth a visit!